I was first introduced to beetroot in its pickled form. This was many years ago and I still enjoy a well vinegared beetroot very much. The first time I tried fresh beetroot I didn’t like it; it was too earthy and nowhere near as acidic enough as I was used to. However my feelings towards this most purple of roots have changed over time and now it’s one of my favourite vegetables. I like to think of this beetroot gratin as a celebration of beetroot; an impressive purple plate of pleasure. Start by peeling and thinly slicing the beetroot. In my experience it’s not a good idea to wear anything that you don’t want turning pink. Preheat an oven to 180C. Lightly grease an ovenproof dish and layer up the beetroot adding a little chopped garlic, salt and pepper between each layer. Finish with a layer of beetroot. 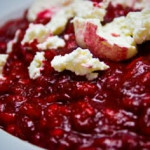 Mix together the cream and the milk, pour this over the beetroot then place in the oven for 45-50 minutes. While the gratin is cooking take the head of garlic and slice off about the top fifth so that the inside cloves are exposed. Peel off any excess papery skin but leave enough to hold the head together. Place the head on some foil and drizzle over a little olive oil and some salt and pepper. Wrap the head up in the foil and roast for around 30 minutes in the oven. Check that the garlic is cooked by trying to squeeze the cloves out of their skins; they should pop out easily. Wait for the garlic to cool down a little before squeezing out all of the cloves and mashing with some more olive oil and salt and pepper to form a paste. Slice the ciabatta and place in the oven to get lightly toasted for around five minutes. Remove from the oven, spread over some of the roast garlic paste and then crumble the goat’s cheese over the top. Put this back in to the oven to allow the cheese to melt. Serve the giant crostini with the gratin. I like to use a mixture of cream and milk for this because you get the creamy taste and texture without it being too heavy. I didn’t intend to have as much liquid left in the beetroot dish as I did but it was actually a good thing as you could dunk the crostini into the fuchsia juices. I love garlic in all its forms but roasted garlic has a little something special about it; its slightly honeyed flavour is wonderful with the salty goat’s cheese, crusty bread and sweet beetroot. Effectively this was a meal made out of bits and bobs I had hanging around but what a pleasing combination it was. “Dunking ciabatta crostini into the flavoursome juices” sounds very inspiring to me!!! 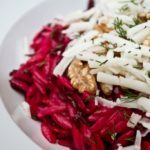 I am a beetroot lover, my favourite panino is sweet pre-cooked beetroot, mayo and olive oil…I should try this recipe and use all those nice raw beetroots instead!!! This is a thing of beauty. Such a vibrant purple colour and it sounds delicious with the goats cheese. I’m a big fan of beetroot, and I always grow it on my plot. I have to say that I love it just plain boiled, with nothing done to it except to add a little salt. I just love the earthy flavour. I tries to work a bit with beetroots, but they didn’t grow too good in the garden. I guess, I have to stick to buying them. That is an intriguing recips. I especially like the garlic and goats cheese crostini. I love beetroots and this looks very great! The colour is stunning. I don’t cook with it as much as I should, given it’s so naturally sweet! What a wonderful dish and no better complement than to pair with giant goat’s cheese crostini! I have a soft spot for beets, no matter which ever style its cooked. I am admiring the idea of beets ofr gratin and its so good and tempting. Beetroot gratin is so unique and it looks incredible..such a gorgeous color! That said, I hope you try the Tourte Milanese..it’s impressive and delicious! Ah feels so odd (though nice) to be back in the blogsphere again. Missed seeing all these gorgeous food posts and trailing blogs and well, blogging myself. This looks stunning! I have a great fondness for beetroot in dishes, because it just lends itself so beautifully to the colours of the dish. Love that deep ruby red. A great idea to pair its sweetness withtangy goat’s cheese, yum! i am just starting to develop a relationship with beets – this is truly a gorgeous celebration of the root!! 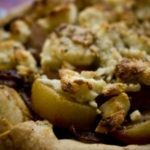 i especially love the roasted garlic in here! I love beet salad and eat often, however I’ve never tried making different ways. This sounds really good, and we spread the roasted garlic just like you do too. Simple yet so delicious!! Beetroot is a great vegetable and this is a great way of eating it. It looks delicious as a gratin and served with the toast and cheese. i still find that beets taste too much like dirt for me to enjoy, but that doesn’t mean i can’t appreciate how beautiful they are, especially here! Magnífica receta un regalo para la vista y el paladar me encanta la berarraga,abrazos y abrazos. Caroline your recipes always look so good! I have to try this one out I mean it would be rude not too!